Recently I finished reading the cycle of Welsh tales commonly mis-called The Mabinogion, but which is properly called the Mabinogi. Full of strange wonders and bold figures, they have influenced many other legends and authors for centuries. They’re also bewildering, nonsensical, and outright deranged. In this first branch of the Mabinogi (as they are called), it will be helpful to remember that in Welsh, w’s are pronounced like long u’s, by which I deduce that his name is pronounced POO-will. Any person knowledgeable of Welsh is more than welcome to correct me in these matters. 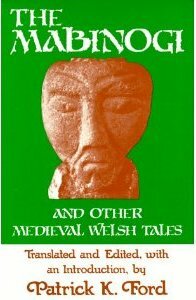 The first story about Pwyll I have heard retold in various places, Stephen Lawhead’s Merlin being one of them. I like it, though it doesn’t appear to have much of a “point.” To make recompense for an unintended breach of courtesy, Pwyll switches places with Arawn, lord of the Otherworld (called Annwfn), and is tasked with ruling his kingdom for one year and a day, while Arawn does the same for Dyfed. Arawn uses his power to cause them each to appear like the other, so no one will suspect the switch. Pwyll rules excellently, and even defeats one of Arawn’s enemies, another king named Hafgan. When the year is up and he and Arawn switch places again, Pwyll returns to Dyfed and asks his subjects their honest opinion on “his” recent ruling style. They say it has been better the past year than ever before, and Pwyll decides to continue those policies. The end. That’s it, and it’s kind of nice, but there don’t seem to be any lasting effects of the adventure. I do like that Pwyll and Arawn both remain totally honorable when it comes to each others’ wives. Pwyll and Arawn’s queen get along very well (remember, she believes he really is Arawn), but every night he turns his back to her and neither touches her nor talks to her until the morning. Arawn is surprised to learn this from his wife at the end, since he had not bound Pwyll by any such oath, but Pwyll is just that kind of guy. There is actually another story in this first branch, telling of the strange way that Pwyll meets his wife Rhiannon, the birth of their son Pryderi, and the near loss of the same. She’s a smart, feisty character, who deserves to have more stories told about her, and she frequently bails Pwyll out of stupid decisions. Stupid decisions such as promising a guest to their wedding, named Gwawl, any gift he requests, only to have said villainous guest request Rhiannon herself. For some reason Pwyll can’t refuse, and is forced to give up his fiancé in order to keep his honor. That’s the kind of stupid logic I don’t like in these stories. I know a man’s word of honor is supposed to be all-binding, but it seems that Gwawl’s request itself is a horrible breach of the guest-host relationship and need not be honored. Such as it is, Rhiannon must go with Gwawl, but not before devising a plan by which Pwyll can come after her, trap Gwawl in a magic bag, and along with his men dance around in a circle kicking the bag until Gwawl is so beat up that he begs for mercy and gives Rhiannon back. Way to handle things the honorable way, Pwyll. The last part of the story involves the birth of their son and his mysterious disappearance while still a babe. The women tasked with taking care of him blame Rhiannon and accuse her of killing him in her sleep. Despite her appeals to reason and the support of her husband, the king, the council of nobles believes her guilty. Her punishment is to stand by the gates to the settlement, tell her story to everyone who passes, and offer to carry any newcomers up to the court on her back, like a mule. This punishment continues for a few years. Then we discover that the infant has appeared in a stable belonging to another noble couple, who raise the boy as their own. As the boy grows older, they realize that he looks an awful lot like King Pwyll. So, being honorable, they take the boy to the court, where he is welcomed with joy and accepted as the lost prince. Rhiannon is relieved of her unjust punishment, and names her son Pryderi (pryder means “delivered of my anxiety”). There will be more about him later.